My name is Ruma. I live in Saidpur. I’m twenty years old. When I was born there was a problem in the birth. I lost consciousness for three days. They took me to a doctor and it was found that I was very weak and had a problem in my left leg, which is shorter than my right. My parents visited many doctors to show them the condition of my leg, but there was no change. My parents were so anxious, listening to whatever neighbours said could help. Any place they said, they would take me in case I could be helped. Later, I was admitted in Saidpur College, but my father’s financial position was not good for covering expenses of college. There is a stipend system in the government safety net program where I could get 1000 taka a month. I had to struggle to get this. I also started providing private tuition and teaching in a school. With the stipend money, salary and private tuition fees I was able to pay for my admission and other costs. I am involved with a Local Ambassadors group. 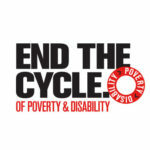 The objective of our group is to establish rights of persons with disabilities in our area. As a group, we act. For example, if some children are not allowed to be enrolled in a school, I go to the school and contact the school management committee and teachers and ask why they are not enrolled in the school, as they have the ability to study. I have seen that when I do something alone it is not very easy to convince others, but if I do something in a group, the impact is much better. It is like one stick can easily break but ten sticks together are very hard to break. My dream is to establish rights for persons with disabilities, especially concerning enrolment in school for children with disabilities. And I want to complete my Master’s degree and get a job in the government sector.